Microsoft this summer will distribute Windows 10 to anyone running Windows 7, Windows 8.1 or Windows Phone 8.1, regardless of whether the existing OS is a genuine or pirated copy. Terry Myerson, head of Microsoft's operating systems unit, disclosed the marketing strategy last week at the Windows Hardware Engineering Community (WinHEC) summit in Shenzhen, China. Microsoft previously announced that it would upgrade users to Windows 10 for free for the first year following its release. Myerson also announced an accelerated delivery time line for Windows 10 -- it previously was expected that the new OS would not be available until at least this fall. The timing of the announcement in China is significant. China is well known for being a hotbed of software piracy. Some 74 percent of all commercial software used in China is pirated, according to BSA, The Software Alliance. Globally, about 43 percent of software is pirated, BSA found. "If Microsoft's move really succeeds, it could put enough of a dent into software piracy to improve the company's bottom line," said Charles King, Principal Analyst at Pund-IT. "That is a worthy goal. I do not see a lot of risks here, since the intended audience is largely made up of noncustomers," he told the E-Commerce Times. Upgrading to Windows 10 in China will involve the participation of Lenovo, Tencent and Qihu 360. The collaborations will assist millions of customers in China, and spur adoption of Windows 10 worldwide, noted Myerson. Lenovo will offer Windows 10 upgrade services at 2,500 service centers and select retail stores in China when the new OS becomes available. Lenovo also will build Windows phones that will be available in mid-year 2015 via China Mobile. Tencent, China's leading social networking and gaming services company, will offer Windows 10 as a free upgrade to its customers on Windows 7 and Windows 8.1. The free Windows 10 upgrade pack will include QQ, Tencent Video and Tencent PC Manager. Tencent will create a Windows 10 universal app for its flagship QQ app and bring its most popular PC games to Windows 10 and the new Windows store. Internet security firm Qihu 360 will provide Windows 10 for free to its customers in China through seamless upgrades. Smartphone distributor Xiaomi will test Windows 10 and contribute to its future release later this year. Microsoft's new approach to software distribution does not exactly mirror what Apple and open source operating system developers do, noted Pund-IT's King. For years, Apple did charge for OS upgrades while Linux distributions most often are free. With Linux, "users typically pay for support," he noted. "The point is that as PCs continue to become appliance-like devices, the OS is an important issue to fewer and fewer people. That trend is likely to accelerate as computing endpoints become increasingly reliant on cloud services," King explained. "Windows is still hugely profitable to Microsoft, but its customers are mainly OEMs, so taking a softer line with end users makes sense." 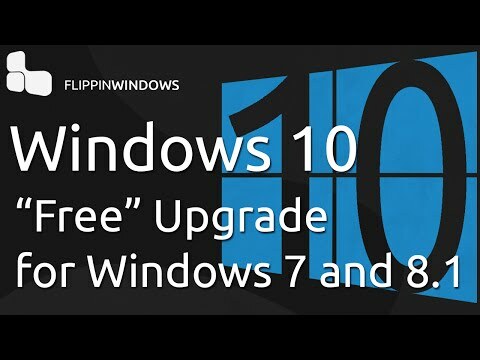 Whether a computer is "qualified" for the free upgrade to Windows 10 depends on how Microsoft applies or interprets its license. It appears that any device running a pirated copy of Windows 7, Windows 8.1 or Windows Phone 8.1 might be able to get Windows 10, but that doesn't mean it would be considered a genuine copy. "If a device was considered non-genuine or mislicensed prior to the upgrade, that device will continue to be considered non-genuine or mislicensed after the upgrade," Microsoft said in a statement provided to the E-Commerce Times by spokesperson Amanda Cedergren. "According to industry experts, use of pirated software, including Non-Genuine Windows, results in a higher risk of malware, fraud (identity theft, credit card theft, etc), public exposure of your personal information, and a higher risk for poor performance or feature malfunctions." Anything Microsoft can do to convert users of older or pirated versions of Windows into users of new versions of Windows helps the company in a few ways, said Jay Lyman, senior analyst for enterprise software at 451 Research. "The strategy is a wise departure from charging for an OS upgrade and reflects a very different client software market that is influenced by open source as well as cloud computing, mobile devices and applications," he told the E-Commerce Times. Microsoft can benefit in three ways, Lyman said. First, it keeps that user a Microsoft user. "Second, the OS today represents a platform on which to promote and sell other software, such as Office," he continued. "Third, this is a way for Microsoft to try and replicate the success and proliferation of software that we have seen in open source -- not only with Linux, but more recently with Chromebooks, which are made more affordable and accessible in large part because they ship with open source software," Lyman explained. Another benefit for Microsoft is stemming the tide of stolen software, suggested King. Software piracy, particularly in developing markets, long has been a thorn in Microsoft's side. "A contributory issue has been the general lack of interest or will among local authorities to seriously police or prosecute pirates," he pointed out. "Microsoft has attempted similar feints in the past, but it may feel that the combined features of Windows 10 -- including cross-device functionality and an all new browser -- offer a good opportunity to lure OS miscreants into the official fold." An optional update to Windows closes a number of hacks that counterfeiters have used to bypass the product activation technologies built into Windows 7. With the update, Windows will try to restore Windows to its proper state, as well as marking tampered versions as non-genuine copies of the operating system. Yea!!!!! while you are at it .. why not just leave the keys in your car and doors unlocked .. cause you know .. even with the best alarm system , some people will still break in and steal it. no idea why people continue to equate copyright infringement with theft. it is not the same thing at all. someone using a copy of windows 7 without a licence isn't stealing. also, the word piracy shouldn't be used either. not that I am condoning use of windows without a licence, just pointing out that it is very, very different from physically taking a tangible object like a car from someone. this has always been the big problem with software, a 100% accurate copy can be made in seconds and any software protection can be reverse engineered. i don't know how you can prevent this and, clearly, neither do Microsoft or anyone else. It is stealing. Here's why - intellectual property is still property, even if it is not physically tangible. The owner of this IP distributes their product for a price. If a person uses said product without the owner being compensated, that person is stealing. It's not a moral issue for me. It's the law. You are right, stealing is stealing, but doomguy is right to point out that it's not the same as stealing a persons car, it's more like shoplifting than it is like stealing a car that someone owns and has paid for themselves. That's precisely why the penalty for stealing a car isn't the same as stealing a shirt. My point is that circumventing copyright protection for the purpose of using the software without paying the producer of the software is, in fact, stealing. Trust me, even before this patch/update is released a crack for it will already be out or in the works.